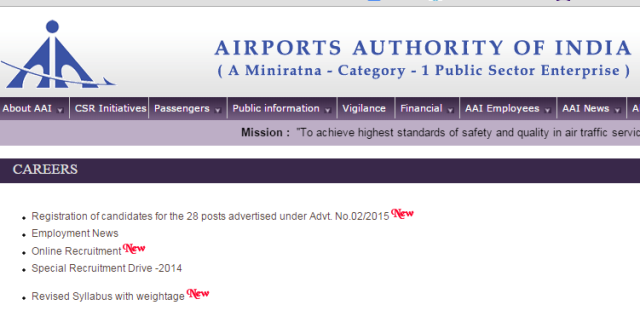 AAI-Airport Authority of India Recruitment for the post of Junior Excutive (Electronics). Airport Authority of India Invitinf Applications to fill 198 vacancies for the post of Junior Excutive in the pay scale of Rs.16400-3%-40500. The candidates possessing valid GATE 2014 or GATE 2015 MARKS and having full time regular Bachelor's degree Enginnering/Technology (B.E/B.Tech) in the desciplines of Electronics/Telecommunications/Electrical with spacialisationin electronics with minimum 60% marks are eligible to Apply online on AAI Website www.aai.aero from 8.9.2015 to 9.10.2015. AAI-Airport Authority of India Recruitment for the post of Junior Excutive (Air Trafic Control). Airport Authority of India Invitinf Applications to fill 200 vacancies for the post of Junior Excutive in the pay scale of Rs.16400-3%-40500.